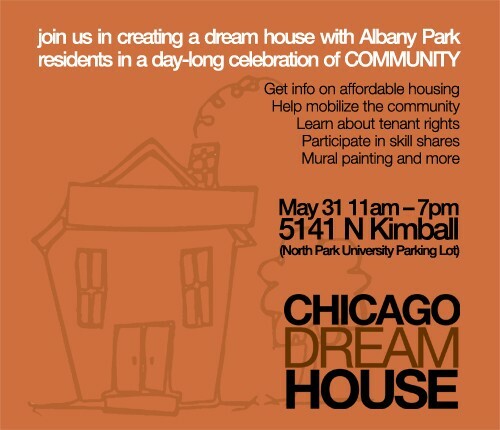 Chicago Dream House is a housing-rights event responding to the foreclosure crisis in Albany Park and Chicago. With the community, we will paint a symbolic “house,” while presentations by local organizations happen in the central area. Community resource and skill-sharing tables will ring the structure. Potluck to follow! CDH is partnering with the Albany Park Neighborhood Council. ¡TODAS LAS PRESENTACIONES TAMBIÉN EN ESPAÑOL! 11am: House and mural painting begins: Skilled mural artists interpret themes of community while the public creates with them. Chicago Dream House is supported by the Propeller Fund, 3Arts funding campaign, and an Individual Artist Program Grant from the City of Chicago Department of Cultural Affairs & Special Events, as well as a grant from the Illinois Arts Council, a state agency through federal funds provided by the National Endowment for the Arts.